You can learn a lot about writing from a Moffat/Gatiss show, whether Doctor Who or Sherlock. Sadly, not all of the lessons are about how to write well. Rip off the plot of a bestselling graphic novel and Hollywood blockbuster to contrive a way for John Watson to forgive his best mate faking his own death. Recreate scenes from your other hit BBC show, making fans (outside London) wonder if the South Bank is ever open to the public. Tease us 3 (3!!) times with the answer to the biggest plot question in television history since Who Shot J.R.? and still fail to provide us with an answer. Otherwise...I absolutely loved every minute of it. Mary is a great addition, and there’s definitely an interesting backstory to her. I know she had to be pretty special to capture John’s heart but I can’t imagine your average girl-next-door type knows about skip codes. Unless I’m massively undervaluing public intelligence? Molly was delightful, I thoroughly enjoyed her Hollywood style clinch with Sherlock in Anderson’s retelling of the fake death (as I imagine did the army of Cumberbitches avidly watching the show). Personally I’m only after him for his coat. 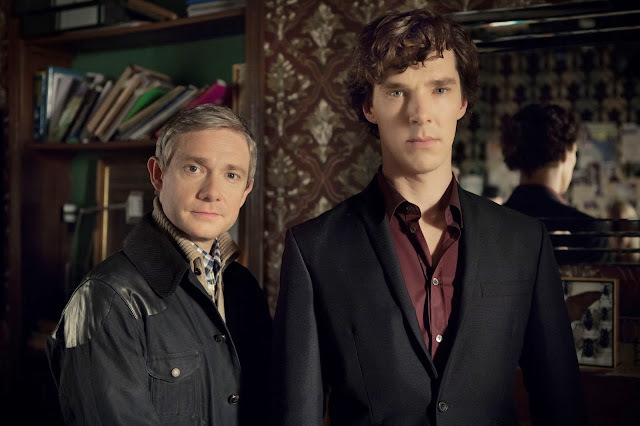 Seriously, aside from everything else the Eleventh Doctor and Sherlock have in common, they give great coat! And so to another similarity: is Derren Brown on the Moffat payroll? I admit I’m not a fan of the illusionist, but really, did we need a cameo? With a cast that includes Benedict ‘Smaug/Sherlock/something important in Star Trek’ Cumberbatch and Martin ‘Bilbo/Watson/Arthur Dent/’ Freeman, we don’t need cameos. The stars of the show are big enough. Which is just as well, as the phenomenal talents of Cumberbatch, Freeman, Gatiss, Graves, Abbingdon et al saved this from being a farce. We had genuine emotions spilling through onto screen (well I thought so). The plot and large sections of the script may have felt like a box ticking exercise, but underneath all that was a group of supremely talented actors having a jolly good time. I would love to see the outtakes of the French Waiter farce. P.S. Was that Steven Moffat himself who had his glasses nicked? 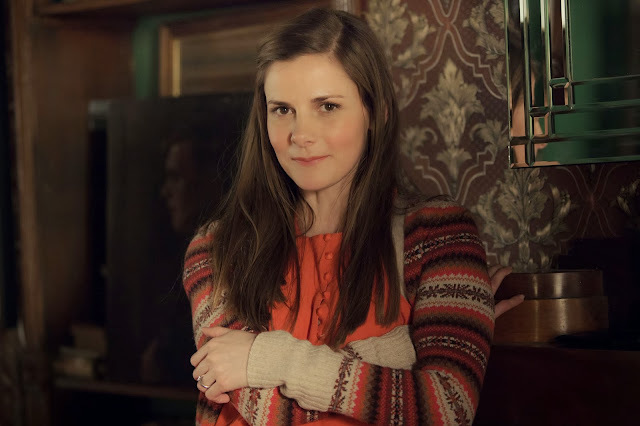 I think I’m ok with Sherlock seeming to be in love with Molly. I hope we see the back of wannabe Tom soon. Maybe feed him to the Cumberbitches? I’m choosing to believe that Sherlock told Anderson the truth about how he faked his death. It was a nice simple solution. The show is still one of the best things on TV this season. But...as I have said time and again this year (ooh, last year actually!) All shows need to raise their game and keep it raised. ITV brought out some of the best drama ever seen in 2013, Channel 4 continued to broadcast provocative instant cult classics. The days of the BBC being the go to station for the best in British telly are over. 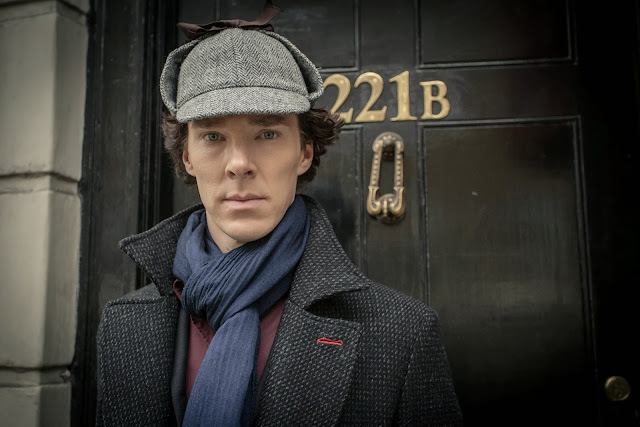 All long running shows are allowed a wobble, but let’s hope it is only a wobble, otherwise Sherlock will fall once more, and this time it won’t be faked. Sherlock Continues Sunday at 8.30pm on BBC ONE.